12-Piece Knife Block Set Just $44.99! Down From $100! PLUS FREE Shipping! You are here: Home / Great Deals / Amazon Deals / 12-Piece Knife Block Set Just $44.99! Down From $100! PLUS FREE Shipping! Amazon is now offering this 12-Piece Knife Block Set for just $44.99 down from $99.99 PLUS FREE shipping! 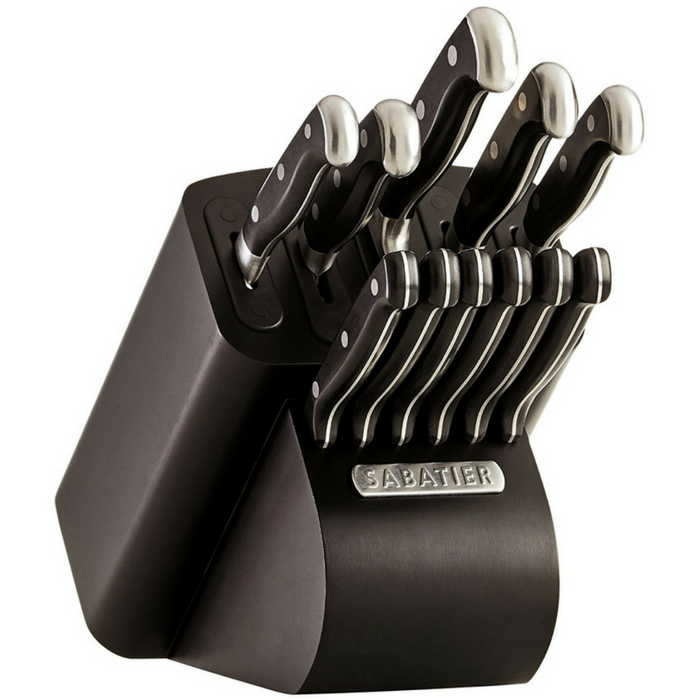 This 12-Piece Forged Triple Rivet Cutlery Set features built-in knife sharpeners that utilize patented EdgeKeeper design. This set includes an 8-inch chef knife, 8-inch slicer knife, 5-inch chef knife with kullens, 4.5-inch fine edge utility, 3.5-inch paring knife, and (6) 4.5-inch steak knives. Each slot features built-in knife sharpeners that automatically hone the cutlery every time the knives are removed or placed back in to the block. Each knife is made from high carbon stainless steel which is stain and corrosion resistant. The EdgeKeeper Pro Block is made from natural hardwood with a matte black finish and has five intergraded sharpening slots. Knives are not dishwasher safe; hand-wash with warm water and a mild detergent; rinse and dry immediately. MODERN FINISH: Each knife is made from high-carbon stainless steel, making the blade stain and corrosion resistant. Each stainless steel handle features an attractive satin finish; making them durable and sanitary.